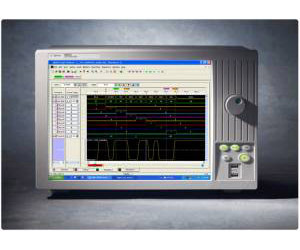 The Agilent 16801A 34-channel portable logic analyzer provides 1 GHz timing, 250 MHz state, 1 M deep memory, and 250 ps resolution (4 GHz)/ 64K deep timing zoom. Upgradeable logic analyzer memory depth allows you to purchase the capability you need now and upgrade as your needs evolve. The fixed configuration with 15" display (touch screen available) delivers the performance you need along with seamless scope integration and an intuitive interface to help you quickly overcome the toughest digital debug challenges – all at an affordable price.